Yanco Agricultural Institute, NSW DPI’s Centre of Excellence for Sustainable Rice and Horticulture, is located between Leeton and Narrandera in the Murrumbidgee Irrigation Area. The National Vegetable Industry Centre and the Murrumbidgee Rural Studies Centre are both located at the Institute. The Institute covers an area of 813 hectares of mixed irrigation and dryland farming country, and is primarily used for research on the efficient and sustainable production of rice, wheat, lucerne, citrus, vegetables, and various organic crops. Research is concentrated on crops grown under irrigation. Rice physiology and entomology trials are conducted at the Institute, however the rice breeding program is concentrated at Leeton Field Station, a separate 242 hectare irrigation property located 7 km west of the Institute. Ninety-five people are employed at the Institute, covering a range of functions including research, extension, education, regulation, forest management, farm operations and administration. The Institute’s campus covers an area of about 20 hectares and includes a wide range of buildings to meet the needs of all activities on the site. 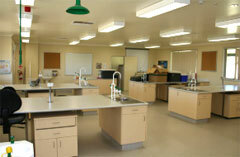 Yanco Agricultural Institute has extensive modern facilities for research and education. Main laboratory building — houses entomologists, cereal chemists and plant pathologists, and incorporates controlled-temperature rooms, microscopy areas. Instrumentation available in the facility supports gas chromatography, high-performance liquid chromatography, differential scanning calorimetry, polymerase chain reaction studies on rice DNA, and rice viscosity studies. National Vegetable Industry Centre — laboratory area. Rice breeding and physiology laboratories — situated in the Kulu building. New purpose-built glasshouse — for use by the rice breeding program. Soils laboratory — to be refurbished for use by the Department of Natural Resources as a soils testing facility by mid 2007. Office and workroom facilities for research staff — situated in the Kulu and Pelde buildings. Tocal College, Yanco campus (formerly known as Murrumbidgee Rural Studies Centre) — offers quality short courses to primary producers and small farm owners. Houses all the campus staff and most of the advisory and regulatory staff. 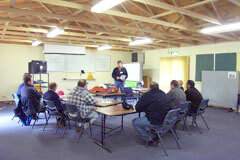 Conference and seminar rooms at the Yanco campus — available for training, meeting and conference purposes. 'Amaroo' motel units — available for short-stay accommodation for course and conference participants. Bunkhouse-style shared accommodation — available in Calrose and Inga buildings, which form part of the main quadrangle. Food Industry Training Centre — has research and teaching laboratories, offices, a seminar room, and a large air-conditioned food-processing area. Swimming pool and tennis court — available for the use of course participants. Library — provides information sources for research and is the core library for the south-western area of the state for NSW DPI offices and staff. Publications Unit — produces course materials. Farming activities at the Institute and at Leeton Field Station are aimed towards providing high quality resources for field research. When areas are not required for research, commercial farming is conducted to provide income to maintain and improve the resources of the farms. A full farming plant is maintained and has been steadily upgraded over the last 10 years. Typical crops grown include wheat, oats, and barley, and lucerne-based pastures are maintained between cropping phases. Wool, prime lambs, and cattle suitable for feedlot entry are the mainstays of the livestock enterprises. These can be utilised, or numbers/types adjusted at any time to suit any required research activities. Tocal College, Yanco Campus (formerly known as the Murrumbidgee Rural Studies Centre), is part of the Yanco Agricultural Institute. CB Alexander Campus, Tocal College's northern campus is part of Tocal Agricultural Centre situated at Paterson. The Yanco Campus of Tocal College has been offering quality short courses to primary producers and small farm owners since 1986. The College's ability to offer accredited training based on the most up-to-date information stems from our relationship with NSW DPI research, extension staff and the expansive resources and sites available to us for training purposes. The Yanco Campus training facilities combined with on-site accommodation continue to be popular with corporate and industry groups looking to complete targeted training in short residential training blocks. More information about Yanco Campus, Tocal College can be obtained from the Tocal College website. Australia’s only rice breeding program is based at Yanco Agricultural Institute (YAI), and is focused on producing high-yielding temperate japonica rice varieties suited to local agronomic conditions and industry markets. Varieties developed at Yanco constitute over 95% of the Australian rice crop. Developing varieties with higher levels of cold tolerance is currently a key target of the breeding program. The breeding program is complemented by researchers working on cereal chemistry, soil science, crop physiology and nutrition, agronomy and rice pest management, as well as by experts in production economics and technology transfer. At the National Vegetable Industry Centre research is conducted on pest, disease and irrigation management of field-grown vegetables. Varietal assessments of vegetables for regional suitability, quality and yield are a regular part of work conducted by the centre. The NVIC team work closely with both the Postharvest Horticulture Group and National Centre for Greenhouse Horticulture at Gosford, as well as with the District Horticulturists based in other vegetable-producing areas of NSW. Currently, staff at the NVIC are working on lettuce, beans, tomatoes, onions, pumpkins and sweet corn. Project work occurs on site at YAI, on collaborating growers' properties in the Riverina, in other parts of the state, and in collaboration with researchers in other states. Staff are involved with international projects, typically in SE Asia. The team has expertise in insect and disease management, irrigation, quality assessment, agronomy, and technology transfer. A 6.4 ha site at the institute has been developed for organic crop production. The site achieved dual certification by Australian Certified Organic (ACO) and the National Association of Sustainable Agriculture Australia (NASAA) in 2000, and is used for demonstration crops and research into organic farming techniques which aim to achieve a reduced reliance on artificial pesticides and fertilisers. Crops which have been grown on the site include vegetables, oilseeds, cereals and pulses. The site is currently being used for a three year research project looking at the production of an ancient type of wheat, Triticum spelta, more commonly known as spelt. Spelt flour is used in breakfast cereals, various health food products, and also in licorice production. Pest and disease identification service for the public. NSW Forests staff manage local state forests, and firewood collection permits are available at the Institute. A major monitoring and control centre for the Tri-State Fruit Fly Exclusion Zone, which helps ensure the acceptability of local fruit and vegetables in domestic and overseas markets. Yanco Agricultural Institute was founded in 1908 as the Yanco Experiment Farm when the NSW Department of Agriculture purchased 323 acres of North Yanco Station from Sir Samuel MacCaughey. Three years later a further 1500 acres was purchased, and smaller land parcels were purchased from adjoining properties between 1911 and 1920 to bring the Experiment Farm to its current area of 813 hectares. 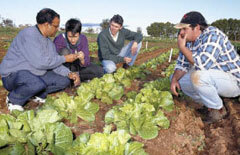 Accommodation for 18 apprentices was constructed soon after Yanco Experiment Farm was established. In May 1928 the property was transferred to the Child Welfare Department and became a home for delinquent boys, the Riverina Welfare Farm. Further accommodation facilities were erected to house a total of 128 boys. The Department of Agriculture continued to conduct crop trials on the property during this period. In 1942 the Riverina Welfare farm ceased operation and the boys were transferred to Gosford. The property then became POW Camp 15, which eventually held over 700 Italian prisoners of war. The farm was still managed by the Department of Agriculture and the prisoners grew vegetables to assist the Allied war effort. The property was handed back to the Department of Agriculture in 1947. Between 1948 and 1951 the farm was used partly for the training of returned soldiers under the Commonwealth Rural Training Scheme. The property was renamed Yanco Agricultural Research Station in 1961, and was subsequently renamed Yanco Agricultural Institute. Education has been a major focus of Yanco Agricultural Institute since its inception. A number of post-graduate students, from Honours to PhD level, are co-supervised by research staff at the Institute. In 1961 it was decided to establish an agricultural college on the site, and Yanco Agricultural College commenced operations in 1963 with a full initial intake of 38 students studying a 42-week Farm Certificate Course. The number of courses offered and the number of enrolments increased over the years as the college expanded and more student accommodation became available, and in 1980 the name of the college was changed to Murrumbidgee College of Agriculture. The college continued to offer residential courses in agriculture until the full-time youth education ceased operations in 2003. The Murrumbidgee Rural Studies Centre took over the short courses previously offered by Murrumbidgee College of Agriculture, and it continues to provide a wide range of courses to farmers, consultants and other members of the community. The Murrumbidgee Rural Studies Centre, now known as Yanco Campus, Tocal College. 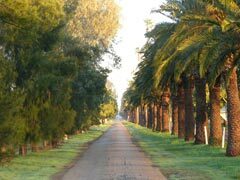 Yanco Agricultural Institute is situated in northern Riverina of NSW at an elevation of 136m and is suited for temperate horticultural production. Temperature can range from a minimum of -3ºC in winter to a maximum of 42ºC in summer with an average rainfall of 433mm. YAI has 1068 ha of agricultural land with a wide range of soil types from grey self-mulching clays to light sandy soils. Irrigation requirements are supplied from the Burrinjuck and Blowering dams via the Murrumbidgee river and an extensive canal system.